Woodland Block East at the Topper Site (38AL23), highlighting the Late Precontact occupation features. The Topper site is one of the most remarkable Paleoindian sites ever found in the Southeastern United States, with well-preserved remains dating from the present back to upwards of 13,000 calendar years before the present. The Clovis remains from the site, from a culture dating from ca. 13,250 to 12,850 cal yr BP, are among the densest ever found in North America. Likewise, a remarkable Late Woodland occupation has been found at the site, roughly dating from ca. AD 800 to 1400. 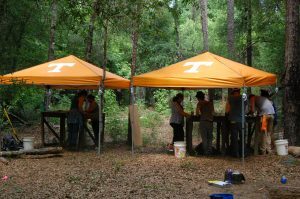 Field schools run by the University of Tennessee, Knoxville Department of Anthropology in the summers of 2015 and 2016, as well as the ongoing laboratory work are focused on excavating and analyzing these Late Prehistoric materials. If you would like to contribute to this project and check out our current progress, please check out our 2016 Newsletter! The Topper Site Field School is an official University of Tennessee, Knoxville field school. Enrolled students successfully completing the field school will receive 3 semester credit hours under ANTH 430 or ANTH 530, Fieldwork in Archaeology. 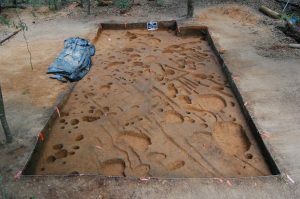 The fieldwork will be directed towards the prehistoric archaeological sites at the Topper in Allendale County, South Carolina. Students will receive training in a wide range of archaeological field survey, excavation, and analysis procedures over the course of the three week field program. The field school will be directed by Dr. David G. Anderson, assisted by a number of graduate students and professional archaeologists from the University of Tennessee, Knoxville, and other institutions of higher education. It will be directed to the complementary goals of student training, public education, and basic research. Should you have additional questions about the project, contact David G. Anderson at dander19@utk.edu. The goal of this independent study course is to introduce students to archaeological laboratory methods and techniques through hands-on experience. Students work with the materials excavated at the Topper Site (38AL23) by UTK students during the summers field school. Students are introduced to and engage in artifact cleaning, cataloging, and photography; precontact ceramic and lithic analyses; basic introduction to geographic information systems (GIS) and database management; and the preparation of national and regional conference posters and presentation. Instructor permission is required for course registration. For more information or to register please contact Dr. David Anderson (dander19@utk.edu). Students may register for from 1 to 3 credits per semester. The field and laboratory work that has been completed has resulted in multiple presentations at regional and national conferences. These presentations represent work and authorship by both undergraduate and graduate students.